The small patch of Indian Corn was harvested and the cobs placed in the greenhouse to thoroughly dry. The kernels will be removed from the cobs and kept in a bucket. It will be nixtamalized and used for making gruel during the Winter. About half the crop was taken by a few squirrels over the growing season. The stalks were removed and put through the shredder and placed on the compost heap. 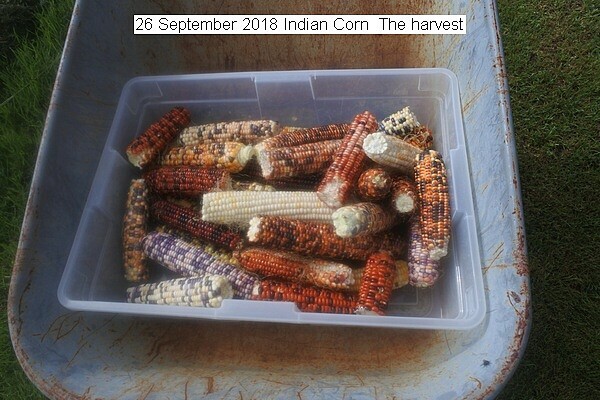 This entry was posted in Uncategorized and tagged 26 September 2018 Indian Corn, 26 September 2018 Indian Corn Harvest. Bookmark the permalink.